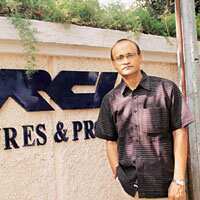 Ambitious plans: IVRCL chairman and managing director E. Sudhir Reddy. Hyderabad: Hyderabad-based Rs2,379 crore infrastructure company IVRCL Infrastructure and Projects Ltd is looking to acquire companies providing so-called oil-field infrastructure services in an effort to grow and diversify its business. “We are not really looking at owning oil and gas wells, which is a different ball game altogether. The acquisitions would be in areas such as onshore and offshore drilling and allied services such as 2D (two dimensional) and 3D (three dimensional) seismic surveys and any software-related services," said E. Sudhir Reddy, chairman and managing director of IVRCL. Seismic surveys are carried out by oil exploration and production companies as part of their exploration or production plans. IVRCL’s plans come in the wake of its acquisition, for an undisclosed amount, of Alkor Petroo Ltd, an oil and gas exploration and production company with 25% interest in three exploration blocks in Yemen and 20% interest in two blocks in Egypt. Gujarat State Petroleum Corp. Ltd holds the rest and IVRCL has already announced its decision to spend $50 million in the exploration of these blocks. Reddy said IVRCL will spend between $100 million and $150 million on each acquisition. “It is better to acquire a smaller company and then ramp it up." However, Reddy added that the company would not mind spending up to $1 billion on a single acquisition if a suitable company were available. IVRCL had previously tried to acquire some large rig companies in Venezuela but lost out as it was not the highest bidder. The company has since built teams to look for opportunities in the US and the Asia-Pacific region. “We would like to primarily own rigs and then go in for allied services such as capping the wells, laying pipelines... and loading and unloading... We are looking keenly at companies located in Middle East, Venezuela and Russia," Reddy said. Shailesh Kanani, a research analyst with the Mumbai-based brokerage Angel Broking Ltd, said infrastructure companies are trying to de-risk their business model by venturing into other related businesses. “IVRCL’s planned acquisitions can augur well for the company if it is able to leverage the opportunities available," Kanani added. Shares of IVRCL gained 0.62% on the Bombay Stock Exchange on Monday to close at Rs497 each even as the exchange’s benchmark Sensex lost 35 points to close at 19,930 points.